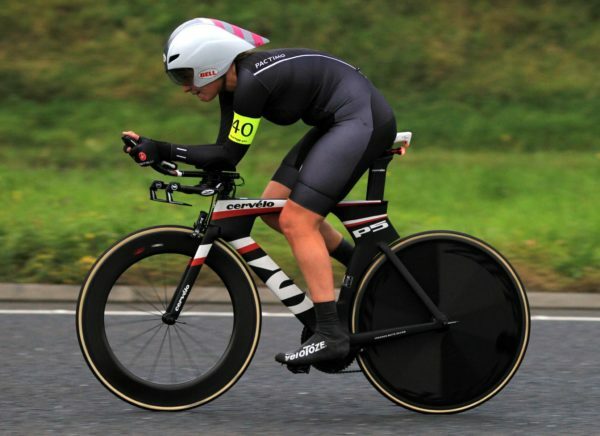 Having enjoyed recent success in Holland in a UCI-ranked time trial, Eileen Burns has taken the Welsh open championships. The test, held on the R25-3H course near Swansea on Sunday, saw Burns finish fastest women. She recorded a time of 53:07 for the 25 mile test; an average speed of 28.24mph. She got the better Kate Allan (Drag2Zero) but just two seconds in a very competitive race for the women’s title. Allan is a former top triathlete who has focussed on cycling in recent years. She is TT specialist who has finished on the podium in 10 and 25 mile British championship tests. Sunday’s Welsh championship event was open to all comers, meaning the Welsh open title was on the line. The British championships, which Irish riders are not eligible to compete for, is a different event. Burns was 4th fastest of the 71-rider field in the combined junior and women’s field, with separate titles on offer. When the elite men who took part on the day are taken into account, she clocked the 29th fastest time of the total 142 finishers. The week before last Burns took a top 10 in an international race in Holland. She finished in 6th place in the 19.7km EPZ Omloop van Borsele TT (UCI 1.1).